A Muslim woman who says she was stopped at an airport "without reasonable suspicion" is awaiting a court ruling on whether her rights were breached. Sylvie Beghal was held at East Midlands Airport under anti-terrorism laws. Police did not suspect her of terrorism but wanted to speak to her about "possible involvement", judges heard. She has asked the High Court to rule on whether Terrorism Act powers for police and border guards breach the European Convention on Human Rights. 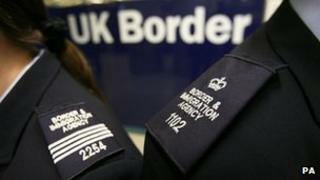 Mrs Beghal, a French National living in the UK, was stopped by UK Border Agency staff in January 2011 after arriving on a flight from Paris. She was then questioned by police using powers conferred by Schedule 7 of the Terrorism Act 2000, but refused to answer some questions until her lawyer arrived. People held under Schedule 7 "must give the examining officer any information in his [or her] possession which the officer requests", and Mrs Beghal was charged with failing to comply. She pleaded guilty at Leicester Magistrates' Court and was given a 12-month conditional discharge. But she later took the case to the High Court on the grounds that stopping and questioning people without reasonable suspicion breached the European Convention. The Crown Prosecution Service disputed Mrs Beghal's claim and argued her rights had not been breached. Schedule 7 is the same power used to stop David Miranda, partner of Guardian journalist Glenn Greenwald, at Heathrow Airport earlier this month. It only applies at ports and airports, and gives officers power to detain people for up to nine hours.